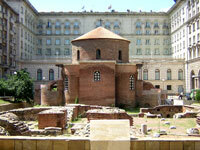 The rotunda church of St George is considered to be the oldest building in Sofia, dating back to the 4th century, and is situated amid the remains of the ancient Roman town of Serdica. The St George Rotunda is famous for its exquisite architecture and layers of medieval frescoes that were discovered under a covering of plaster. The church currently functions as a museum and the magnificent dome is protected by UNESCO. It is located in a square enclosed by the Presidential Buildings and this makes the contrast between the ancient and the modern quite striking. There is a fair amount of information on the history and significance of the site available at the entrance, which is worth reading. There is a pleasant restaurant next door to the site where you can enjoy a meal with views of the church, and if you linger for a while you might well see the guards marching by. Visitors must ensure that they are dressed appropriately and conservatively as people with bare arms or legs will not be allowed entry into the church. Address: bul. Kniaz Aleksandar Dondukov 2, 1000 Sofia, Bulgaria.